Paul Manwaring from Bethel Church in Redding, California is with us for all three morning meetings on Sunday (25th May). 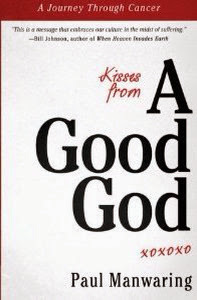 I recently finished reading his book "Kisses from a Good God" which tells of his journey of having prostate cancer and all that he learnt through it. I want to thoroughly recommend it to anyone either walking through having cancer, or helping someone else on that journey (which is pretty much all of us). Many of you will know that Bethel Church is famous (amongst other things) for the many remarkable healings they see. One of the tensions for any of us who believe that God still heals people today is what do we do when people aren't healed, or aren't healed in the way we would like them to be. Some resort to saying that everyone should be healed and if you aren't then there must be something wrong with you or your faith (always an encouraging line!). Others will say the illness must be from God so learn from it. Others bury their head in the sand and just move on to the next person to be prayed for, hoping it will "work" with them. One of the things I really appreciate about Bethel, and Bill Johnson who leads the church, is their willingness to wrestle with this tension. To honestly face the issues head on when people aren't healed and even when they die, whilst also creating a culture where there is an incredible faith and expectation of God healing people. That's part of the culture I long for us as a community to grow and develop. Paul's book speaks right into the middle of that culture. His healing from cancer came not as a divine intervention from God, but at the hands of the doctors and surgeons who treated him. Many might regard that as a "second class healing", that God didn't really come through for him so he had to rely on the medical profession instead. Paul's argument is exactly the opposite, that healing via doctors is just as much "from God" as any other sort healing and isn't a second class healing. I love that emphasis. It helps us to understand how we interact with doctors whilst we pray for people to be healed. It gives huge value to the work of doctors and nurses and those involved in medical research. And for me it sits well with my faith and my understanding of how God works in the world. "Two months after my surgery, I stood in the kitchen of a doctor friend and we talked about healing. He said to me that the goal is to get well. He told me if I got a headache, he would pray for me. If the headache remained he would give me a pain reliever. Why? Because the goal is to get well. Yes I would have preferred a dramatic, supernatural intervention. But strangely, I now enjoy the fruit of journey I did not choose to take." You can get Paul's book here, as well as catching him in person on Sunday morning.